Two more pieces had their opening at Progress Festival on Valentine’s Day. While they couldn’t be more different, they did share something in common. When it comes to creating healthy inclusive communities, let face it, sometimes even our best intentions give way to tension and friction amongst neighbours. Sometimes we even end up loosing sight of what we were trying to accomplish in the first place. This is exactly what happens in Dis Merci, as four good neighbours come together to plan a special welcome party for the arrival of a new refugee family. The audience is witness to a series of satirical vignettes incorporating different theatrical genres and conventions. Aside from the stimulating stage images, the stories subject us to many awkward discussions, forcing us to extrapolate the underlying message. What helps us is that each performer not only holds their unique viewpoint but also shares their own experience of otherness. In the long opening scene, for instance, Marc Barakat is silently baking a cake for the festivities, accidentally mixing in eggshells without hesitation. The collective Joe Jack et John mandates inclusivity, including performers who have an intellectual disability. We might make assumptions about Barakat’s abilities until we hear his articulate backstory as the son of two Egyptian immigrants. Next, Emma-Kate Guimond is a Montrealer suddenly ostracized for speaking English. We later learn she is fully bilingual (can stand her ground in French) and chooses to speak English both by circumstance and choice. Dany Boudreault would appear to be the member of this group who can integrate into society easiest, that is until we hear him emotionally communicate his deep personal feelings as an actor – considered to be on the bottom of the socio-economic ladder. Finally, Ally Ntumba captivatingly relays lived experience as an immigrant himself, including tips he received about living successfully in Canada. The show’s title is an imperative sentence after all. These tips are announced throughout the show, projected onto a curtain, and translated from French to English using subtitles. In fact, this is just one way subtitles are brilliantly built-in as if incidental. Balloons are the most pronounced aspect of the piece. They become puppets, masks, and props. Who can forget the long orange sausage shaped one. And there is the abstract animal that Guimond insists is NOT an African animal despite Ntumba’s insistence on naming it an elephant. The whole argument leads to a discussion about modern art as defined from a European perspective. Ntumba reminds her of what Picasso stole from the Africans. Not everyone shares the same notion of contemporary! At several moments, the cast members compete for a place on the La-Z-Boy. What I find effective about this show is that everyone must confront their otherness, both together and alone. Consequently, we also question our preconceived notions of acceptance and contemplate if and how everyone can truly have a place at the table (or at least a moment on the chair!). 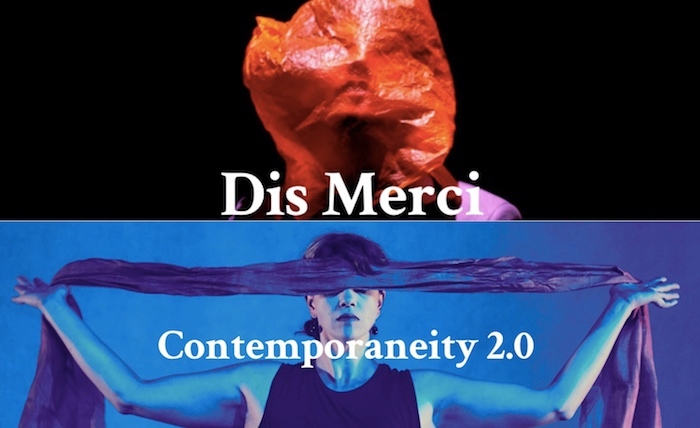 The concept here is inspiring: Anandam Dance Theatre wants to redefine our (2.0) relationship with contemporary as current rather than Eurocentric. I must admit it really got me questioning some of my own assumptions about what I view as contemporary. Like Dis Merci, it puts what we think we know on its head. The first of this two-program series is titled “Becoming”. In this dance a women travels through various dream-like worlds, seeking freedom from her oppression, and regaining her power. Initially it’s beautiful to watch Brandy Leary’s control of the stage, moving with utmost conviction. On top of it, she is blindfolded for much of the piece. In one scene, she sits – the stage almost in complete darkness – and we see someone looking at herself in a small compact mirror, as if for the first time. Unfortunately, the movements become repetitive and I fail to see a story develop, or understand where we are being led. The heart-rending live violin accompaniment by Parmela Attariwala upstages the dance, as do dozens of bells hanging strikingly from above the stage, like a chorus. I enjoy when Leary makes music, her feet emerging from an upside down tableau to play a few of the bells. This moment lasted merely seconds. My guest and I wished they were used more. Progress Festival, in general, has been doing a great job at challenging what we accept as normal or certain, and (re)educating us. Both pieces begin with a land acknowledgement as has become routine at artistic events across the city – rightfully so. But many of us have not learnt the greater lessons. Before the start of Dis Merci, Ross Manson of Volcano Theatre (co-presenter and curator) took things a step further by talking about specific treaties which took place on the land; and Gein Wong (director) appropriately spoke before Becoming about the endless movement of people on this land, migrating for a plenitude of reasons.